It is hard to believe that the holiday season is right around the corner! Don’t make the common mistake of waiting until the last minute to book that perfect venue, because spaces are booking up quickly already! In preparation for the holidays, the girls at ABCey Events have put together some of our favorite entertainment, decor, and other ideas in order to host the ultimate gathering with friends and family! 1. D.I.Y. centerpiece: This festive candle centerpiece is very easy to create. 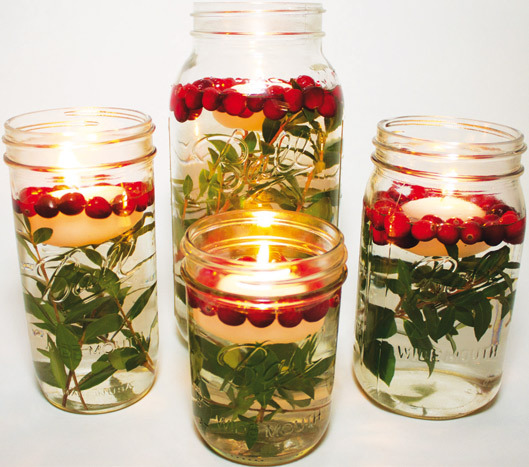 Simply fill a Mason jar with water, greenery, cranberries, a ­floating candle, and viola! Guests are guaranteed to be impressed with your Martha Stewart-like display. 2. 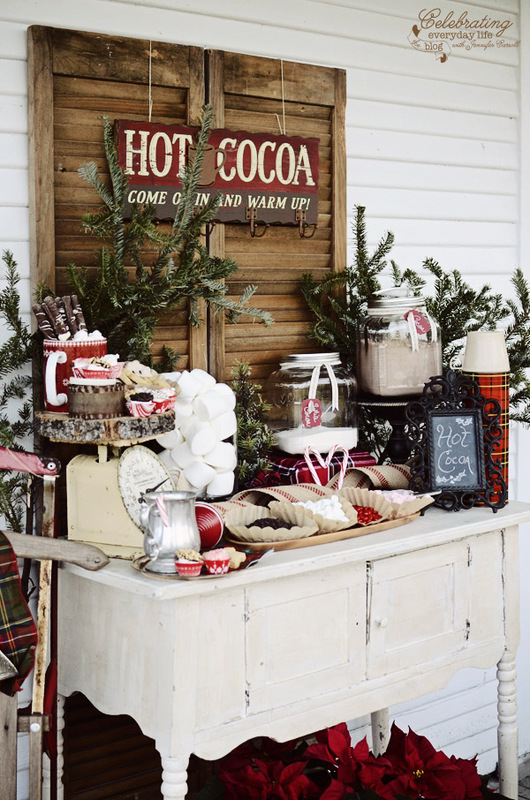 Hot chocolate station: Hot cocoa stations aren’t just pretty to look at, they also make a fun & festive addition to any holiday party or open house you might be hosting this year! You can create one using items you already have on hand, or go crazy with items such as flavored marshmallows, cherries, malted barley, chocolate shavings, and whipped cream. 4. 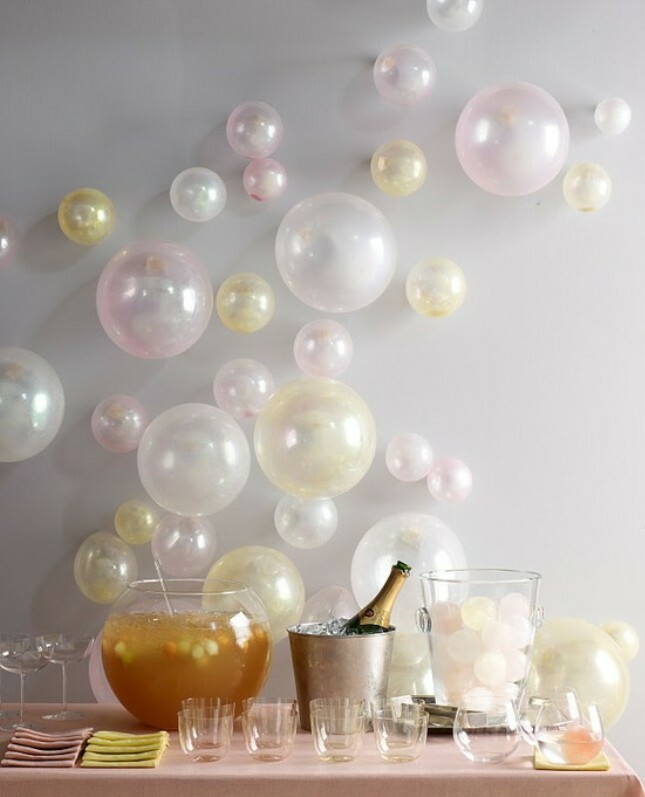 Balloons & bubbly: All set to ring in the New Year, this refreshment table shows that even simple decorations like these “bubbly” balloons in pretty pastels can help create a party atmosphere. Don’t forget to accent with metallics such as silver & gold (TREND ALERT)! 4. Warming cocktails: When the temperature drops it’s time for the cocktails to heat up! 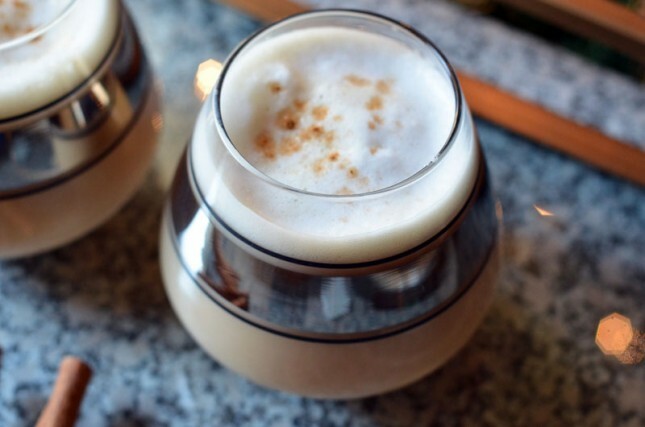 We found this delicious Chai Hot Toddy recipe on Brit + Co. and cannot wait to serve it up at our next holiday party! With ingredients ranging from spiced rum to ground cinnamon, no one will be able to resist this delicious holiday drink. 5. Photo Booth: No bash is complete without a dedicated corner decked out with a festive background and loads of silly & holiday-oriented props! 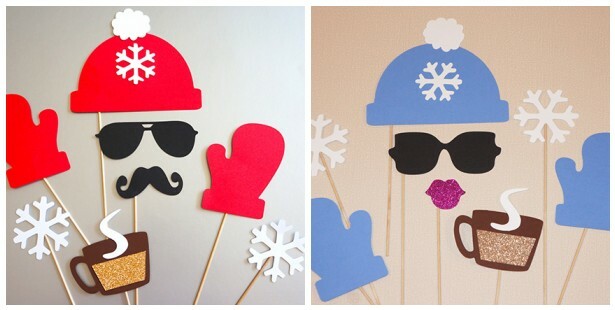 In addition to the standard mustache and sunglass on a stick, we found these awesome snow bunny & Holiday props for Him & Her on Etsy! Have you gotten your holiday festivities in order?! Let us know in the comments below or on Facebook & Twitter! It’s that time of the week again! Start planning your weekend with the help of ABCey Events to maximize fun to its’ fullest potential on your precious days off. From boat parties and and food festivals to baseball games and flavor tripping parties(?? ), read on to discover what this weekend has in store! 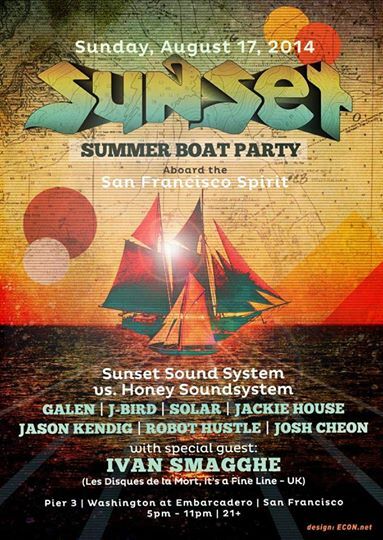 Featured Event: Sunset Sound System Summer Boat Party | Sunday, August 17th | 5pm-11pm | Pier 3 | $55-60 | The Sunset Summer series is coming back to the Bay, but this time it’s on a boat! While a San Francisco August can make a ‘summer boat party’ seem like a bit of a joke when you’re wearing your bathing suit under tens of jackets, the feelings of summertime freedom and dance are still kickin’ when you are aboard! Included in the lineup is an array of San Francisco’s most well-recognized musical residents, including Galen, Solar and J-Bird as well as Honey Soundsystem star Jason Kendig, a man who is sure to bring in a fun crowd. Dance, lounge and mingle on the beautiful Bay as the boat rides off into the sunset! 1. 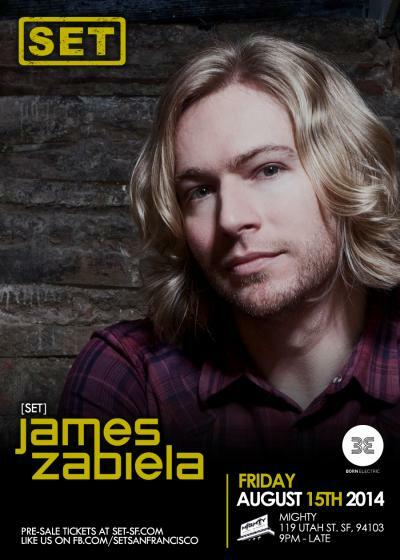 James Zabiela at Mighty | Friday, August 15th | 9pm | The Mighty (119 Utah St, San Francisco, CA) | English-bred James Zabiela has been a path-forger of deep emotional house music around the world for over a decade. He has recently taken a shift in his musical production, steering away from super-dance and moving towards more personal tracks! The blonde cutie will be sure to deliver all of the emotion and personality that he is known for when he comes onto the massive soundsystem at The Mighty on Friday. And, one of our pals, Birthday boy Darren Grayson of DISTRIKT will be opening. This is a night not to miss!! 2. Flavor Tripping Party | Friday, August 15th | 7:30pm-9:30pm | Drake SF (508 4th St, San Francisco, CA) | $20 | This is the ultimate food tasting party! 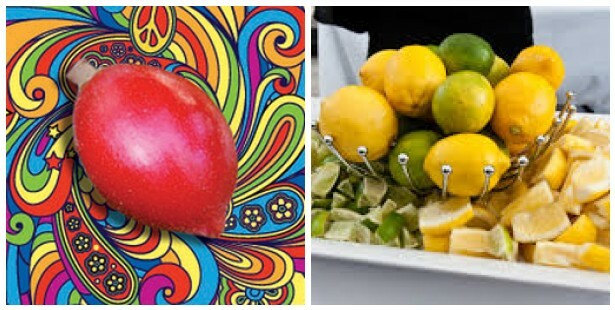 Flavor Tripping is a natural fruit that contains an enzyme that makes all sour tasting foods sweet! So eat lemons, limes, vinegar and other sour foods! They’ll temporarily taste surprisingly sweet. Trays of sour tasting foods will be passed around and all you have to do is put the berry tablet on your tongue and make sour lemons taste like lemonade! Unique flavor tripping cocktails will be included, so make sure you go check out this unique party! 3. 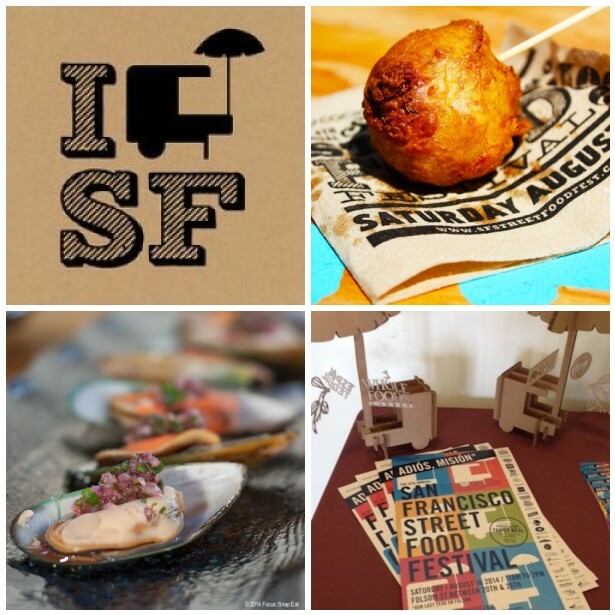 San Francisco Street Food Festival | Saturday, August 16th | 11am-7pm | Folsom and 24th Street, San Francisco, CA | It is FINALLY that time of year again! The SF Food Festival is back and ready to go! With over 80 local vendors, this day is a celebration of the diverse population we live in in this great city! Cancel all your plans and head over to Folsom Street for a day you won’t regret! 4. BAVBB Presents 2014 Cal Cup Championship | Saturday, August 16th – Game 1: 12:30pm & Game 2: 3:30pm| Sunday, August 17th – Game 3: 12:30pm, Game 4 (Championship game): 3:30pm | Big Rec Field (Golden Gate Park 7th and Lincoln Ave. San Francisco, CA) | Tired of paying the Giants exuberantly priced tickets but still want to go to a baseball game this side of the bridge? This game is really cool, the three oldest vintage baseball teams in California take each other on this weekend in the Bay Area Vintage Baseball (BAVBB). Admissions are free so grab your kids or friends and head over to the Big Rec field and watch some baseball! 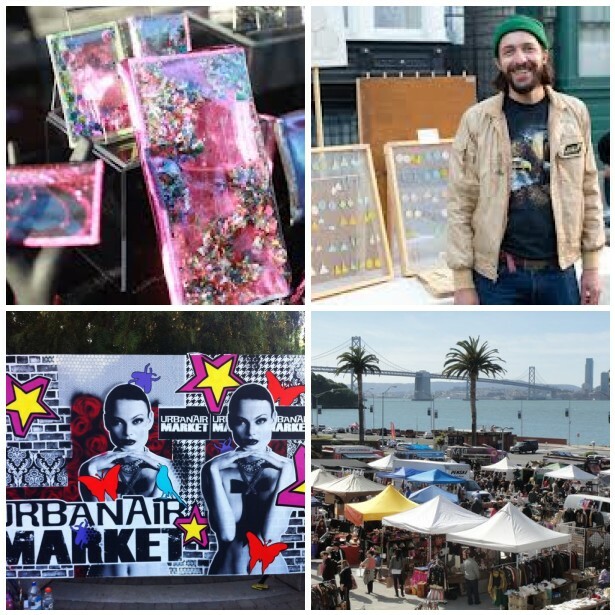 5.Urban Air Market in Dogpatch | Sunday, August 17th | 11am-6pm | Esprit Park, Minnesota and 19th Streets | The Bay Area’s favorite sustainable shopping event is prepping for their summer pop-up show in San Francisco’s historic Dogpatch neighborhood. The market will feature 100+ emerging designers and established brands, in addition to talented artists and musicians from our local creative community. Urban Air Market provides the Bay Area with a unique shopping experience that allows consumers to meet the designers and artisans of their favorite products, while making sustainable, eco-friendly and locally produced goods accessible to the public. What will you be doing this weekend? Eating fantastic food on Folsom, or going boating with the Sunset crew? Let us know what we missed in the comments below or on Facebook & Twitter! 5 Fun Apps for Working Out! One of the many great characteristics of the San Francisco Bay Area is its emphasis on health and well-being. With the wave of apps and startups from this area, we have seen lots of fitness related tech that can help you get more from your workout, track it and even motivate you to get active! As event planners, we need to stay healthy so that we can be on our toes for long hours. We’ve compiled a great list of 5 of our favorite fitness apps that keep us on the go! 1. Zombies, Run is one of the most fun, creative apps we’ve seen. It places you in a scene where you really do need to run for your life, and gives you that motivation you’ve been looking for. You are set in a narrated apocalypse intermixed with your own playlist. The fun doesn’t stop when you stop running, because there are games that come with the app to immerse you even when you’re not working out. Even if you haven’t hooked onto the new zombie fad, this app is so much fun! 2. BitGym makes long treadmill runs a lot more fun, taking you on a visual vacation through the streets of somewhere far away. Fuel your run being immersed in a tour of the Grand Canyon, or sprint the trails of the Alps without a plane ride! The visuals are beautiful and it allows you to motivate your runs with the promise of seeing something amazing! 3. Strava is software that keeps track of your workouts, runs, bike rides and cross-training, and then helps you compare them day by day to track progress and effort. You can even compare against other athletes using Strava! You can upload your routes via GPS capable gadgets and when you get back, you can see your hard work displayed on Strava.com! The site even gives challenges for users to compete in to push themselves even more. 4. 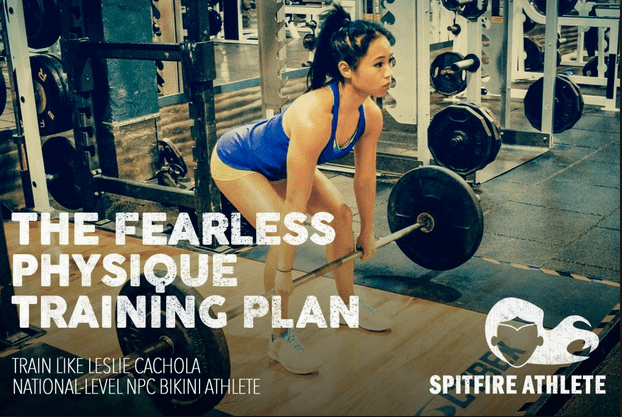 Spitfire Athlete is an app that promotes health and strength in women, to push them to be more than they imagined. It connects you for free with coaches, step by step training and the information you need to reach your goals. The app is action packed with scientific facts and motivation to build strength and be the best you can be! We love this because it strives to make working out about feeling good and we love how easy it is to the connect a community of healthy information sharing! 5. 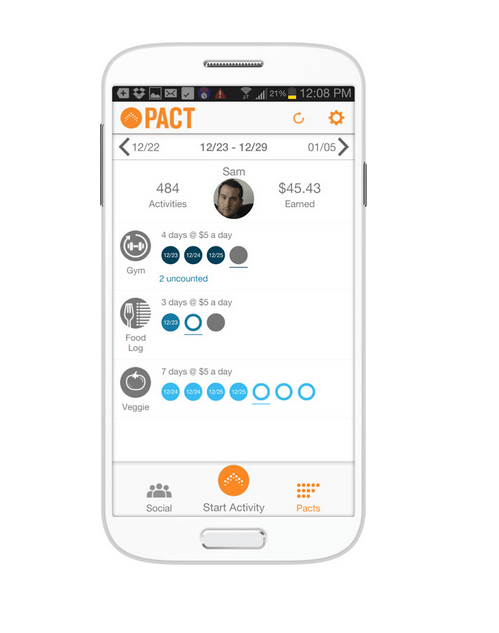 GymPact is a mobile app that sets up incentives with money! Are you trying to exercise more or eat healthier? Set goals on pact and if you don’t meet these goals, you pay. If you do, you are paid by other members who didn’t meet their goals. We love this app because it creates real world incentives. The most important way to grow is by setting goals, and earning money while you complete your goals is a just fun bonus! What are your favorite workout apps? Did we miss anything great? Let us know your thoughts in the comments below or on Facebook & Twitter! Today’s Startup Monday post features DoubleDutch, a company that specializes in data-driven mobile technology. They use engagement data from the mobile event app to ensure that each event is better than the previous one. Located in the heart of San Francisco’s Mission District, DoubleDutch features applications for events, conferences, associations, and trade shows worldwide. We love that this company has all our event essentials covered with their award winning data-driven event app. Having the event agenda, surveys, and attendee networking options all available on one application makes it super easy for us at ABCey to keep up to date with all the latest event logistics! How it Works: DoubleDutch allows each client to design their app to look exactly how they like. 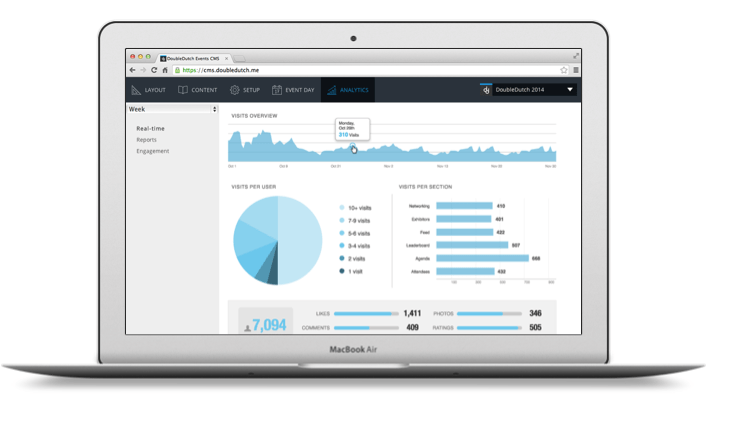 They make it easy to fully customize the branding of the app and easily configure layout. 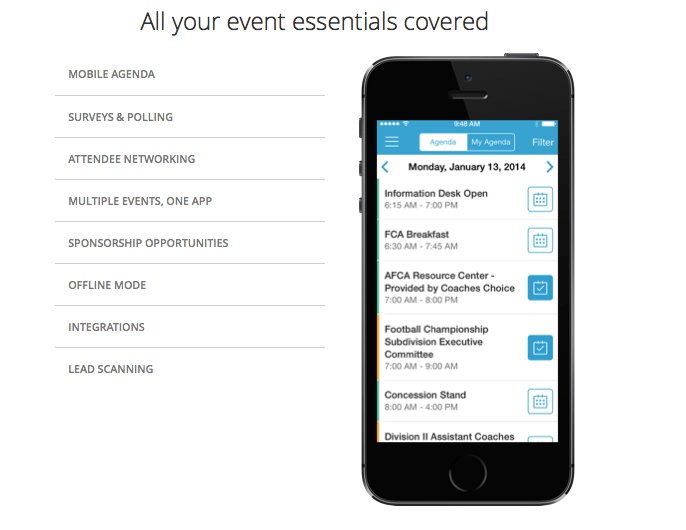 With the mobile agenda option, event participants can access the up-to-date mobile guide at any time and easily create their own personalized agenda with a few simple taps of their mobile device. DoubleDutch can also facilitate both digital and in-person networking. Attendees can connect with others based on interests, professional titles, and more! And to keep attendees engaged and interested, DoubleDutch features a survey and poll option within the app to provide feedback. Why We Love It: As event professionals, we know last minute content and schedule changes are inevitable. However with DoubleDutch’s content management system, our job becomes a lot less of a headache! 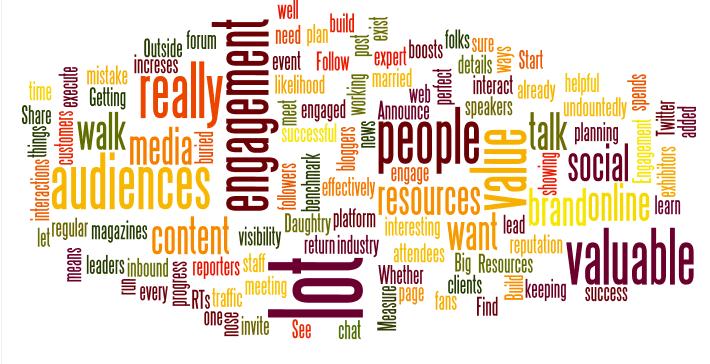 Throughout the event, valuable information about attendees’ whereabouts, interests and sentiments is collected. The DoubleDutch CMS allows organizers to see this information in real time and make any necessary adjustments to the event. DoubleDutch also provides concise and specific event analytics so you can identify which sessions, speakers, and exhibitors are buzzing, and which ones need extra attention before it’s too late. Having all of this information and features included in one application makes DoubleDutch a company that we think will definitely have a positive impact on the event industry! Will you be using DoubleDutch in the future for your next event ?! Let us know in the comments below or on Facebook and Twitter! 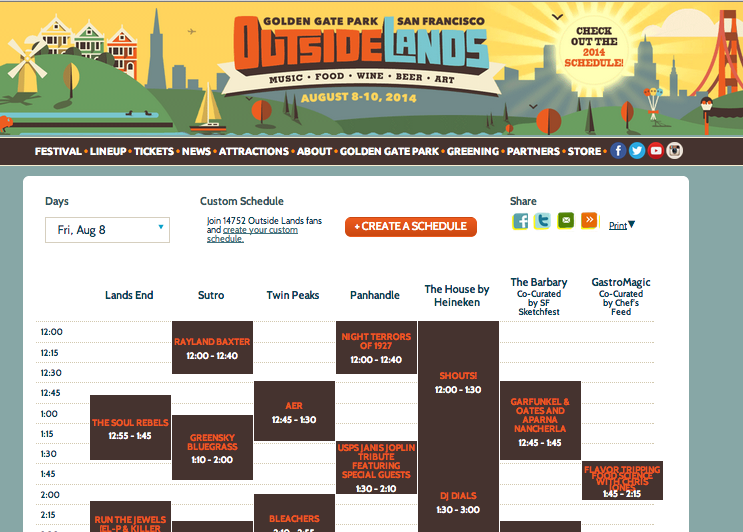 Whose ready to rage at Outside Lands this weekend?! Here at ABCey, we are getting ready for this music filled weekend. But don’t worry, for those of you who aren’t going we have some fun alternatives for you! 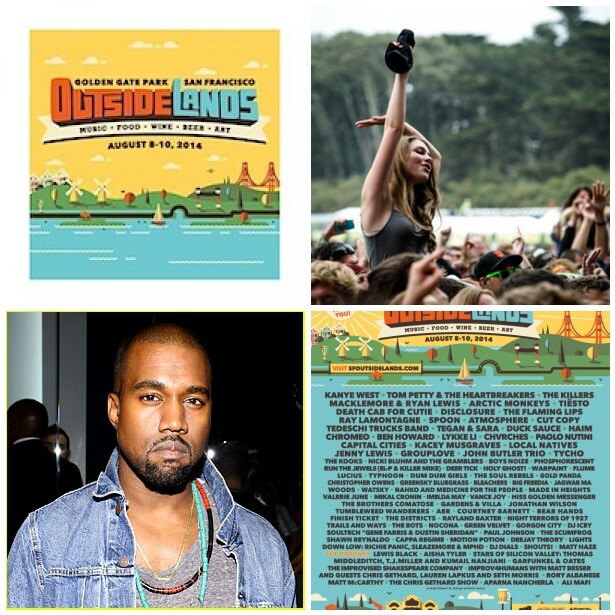 Featured Event: Outside Lands |Friday August 8th-Sunday August 10th| 12 pm-10 pm |Golden Gate Park| This is the place to be this weekend. Hundreds of thousands of music lovers flock to SF to jam to the tunes of their favorite bands and artists! Some performers include headliners Kanye West, Arctic Monkeys, Death Cab for Cutie, Tiesto and so many more! Tickets are sold out but you can head over to StubHub and find single day tickets (Warning: They are expensive)! 1. Outside Lands Night Show: The Killers |Saturday August 9th|10 pm| The Independent, 628 Divisadero St., San Francisco| Whether or not you are going to Outside Lands, you can catch some of the acts afterwards! 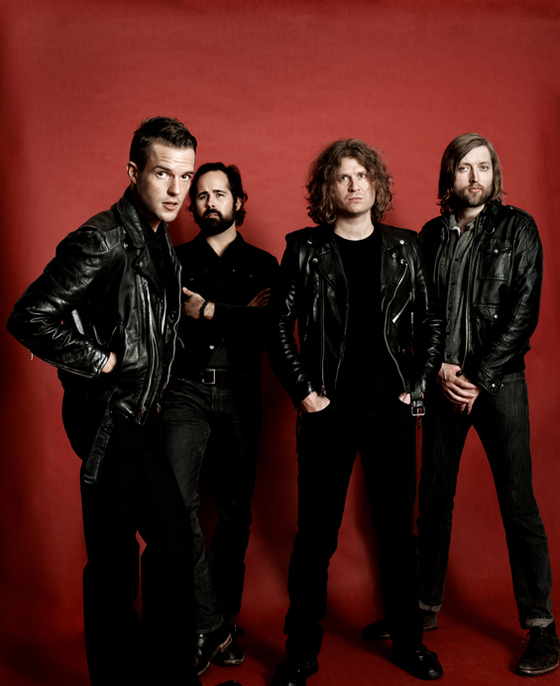 The Killers on Saturday night will be performing at The Independent at 10pm. If you went to the festival all day and can’t seem to curb your music craving or weren’t able to get tickets to Outside Lands but really want to experience part of the magic, then go on Saturday night to see The Killers! 2. 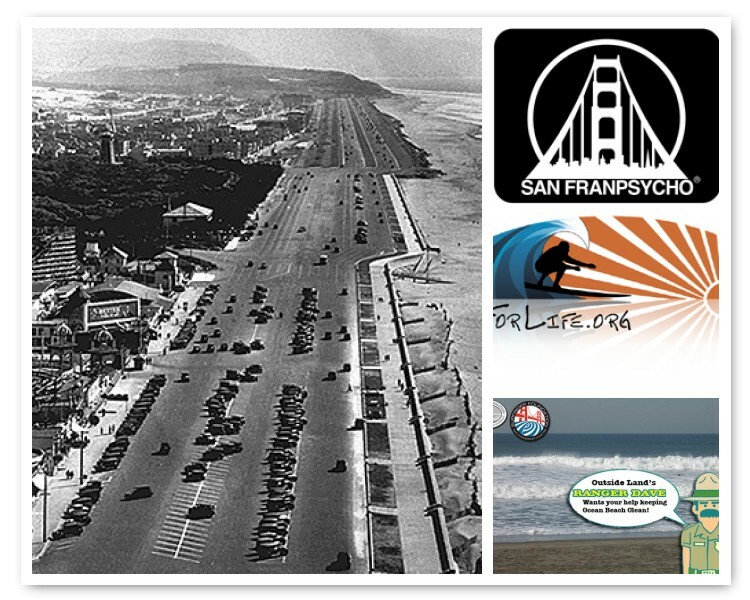 Outside Lands Beach Cleanup: |Aug 9th| 10 am| |Ocean Beach at Noriega & Great Highway| Help keep San Francisco beautiful this weekend by joining the Outside Lands clean-team pick up the beach! Refreshments will be provided by Devil’s Teeth Bakery and Noriega Produce and the cleaning supplies are supplied by Surfrider, San Franpsycho and Indosole. And, as if you needed another reason to go, festival gates are within walking distance! 3. 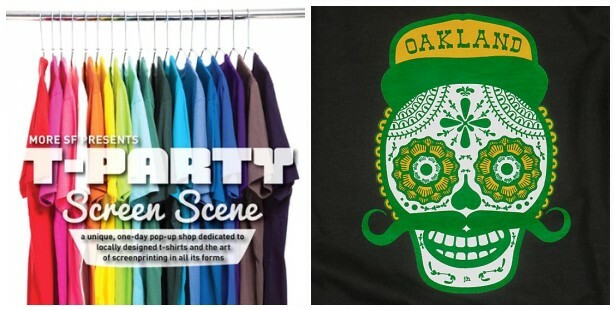 T-Party Screen Scene: | Aug 10th| 11am-5pm| The Chapel, 777 Valencia Street SF| This pop-up shop is a unique, one-day event that is dedicated to locally-designed t-shirts and screen printing. Some of the vendors include The Girl and Rhino, Original Language, Oaklandish and The Loin SF. This is a must stop event to grab some of the most unique t-shirts in one of the most unique cities. 4. 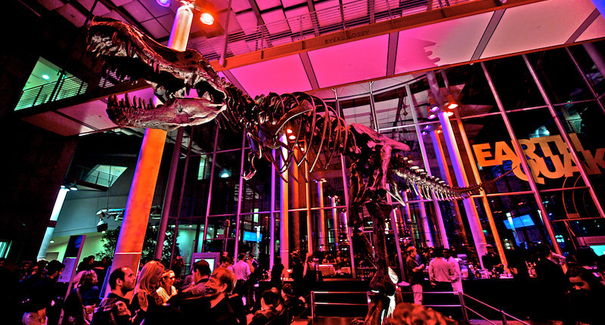 NightLife LIVE: Emerging Music & Art Paired With Science |Aug 7th| 6pm-10pm|The Cal Academy of Sciences| Check out rotating art installations while enjoying the music of neighboring Outside Lands. This is a perfect place to relax and enjoy great music accompanied with great art! So bring your friends out for a cultured night to wind down the work week! Tickets are only $12. 5. Deaf Louder: The Second Bay Area Deaf Dance Festival: |Aug 8th- 9th at 8pm| Aug 10th at 4pm| Dance Mission Theater, 3316 24th St, SF| Maybe you’re looking for something that will take you away from the Outside Lands craziness and want to experience something else this weekend. 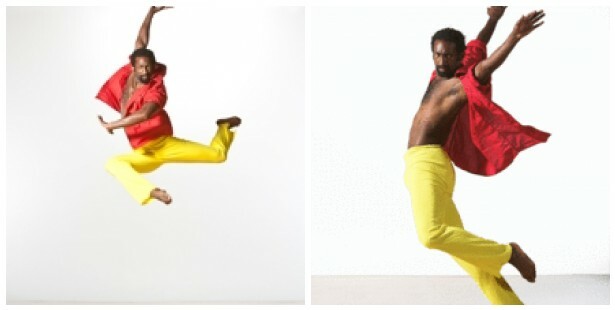 Deaf Louder features deaf dancers in an evening long showcase of contemporary dance and music. This dance festival is unlike any you’ve ever been too. Bringing out many emotions in the viewers, this is sure to be a great hit! As event professionals, we often face many registration challenges before, during, and post event! From creating the attendee list to sometimes mailing out invitations, a lot of work goes into pre-event planning. This is where Event Farm can help! Event Farm is an innovation focused company that offers a customized, online invitation, ticketing, guest registration, mobile check-in and digital activation platform designed to make planners more effective. They provide creative solutions to promote brands and engage targeted audiences making the event planners job way less hectic! We know Eventbrite is the current main ticketing source for events, but Event Farm provides real time check-ins for guests allowing for additional guests on the fly and arrival alerts to keep event planners in the loop and up to date! We also love that Event Farm provides post event data to help us improve for the next event! How it Works: Pre-Event | The first step with Event Farm happens before the event. 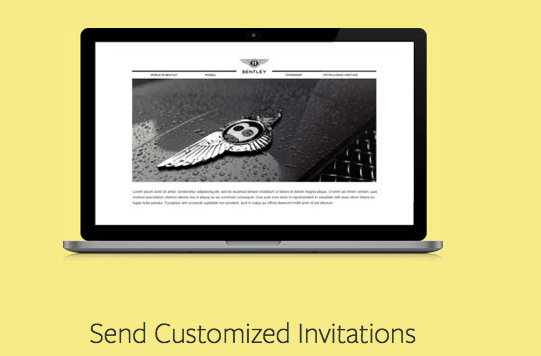 This includes the customized invitations and ticketing sites. 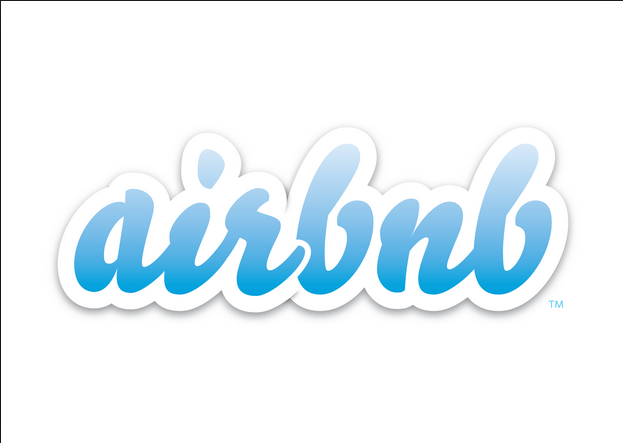 When planning an event your brand matters. The invitations are what guests see first so they better look great! Event Farm also allows planners to see a 360 view of the event, tracking realtime read-rates, RSVPs, and guest responses. How it Works: During Event | During the actual event a planner has many things to worry about and keep track of. 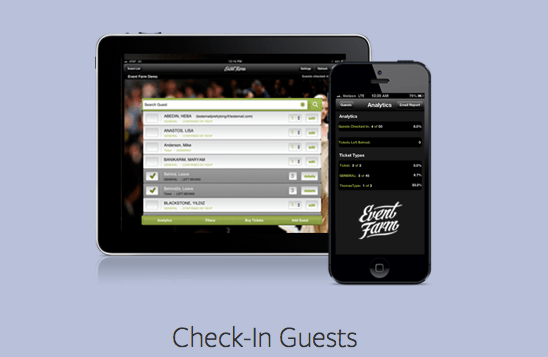 With Event Farm, the guest check-in is taken care of with their mobile app. No barcodes, no paper. Quick and effective! 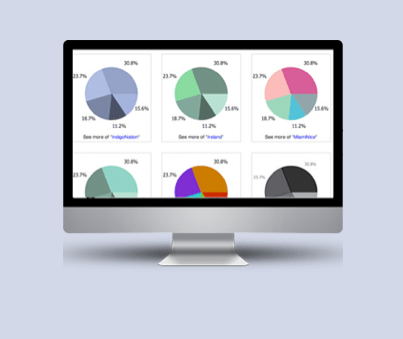 How it Works : Post Event |Post event is all about gathering data. Event Farm provides planners with a multitude of data information on the event to help foster long term guest relationships and to improve on future events while measuring guest engagement. 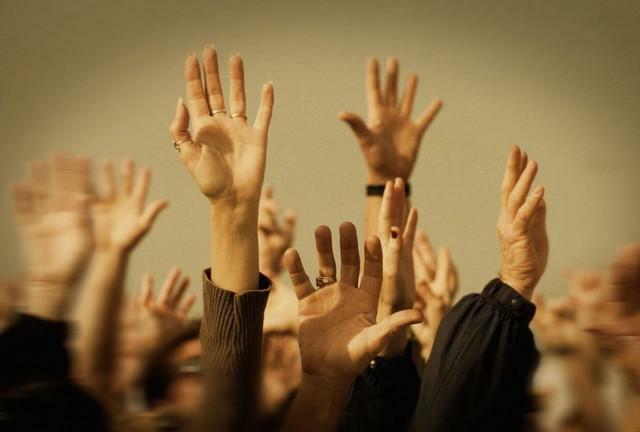 Will you use Event Farm for registration at your next event? Let us know in the comments below or on Facebook and Twitter!